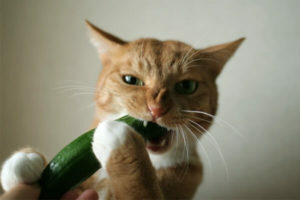 Are Cats Scared of Cucumber? There is this trend, well, I wouldn’t call it a trend purr-say, but people seem to believe their cats are scared to death of cucumbers. Now, I am no scientific expert on the matter but I am going to explain to you why you should not be doing this and why your cat is reacting this way. No, your cat is not afraid of cucumbers. It is pure common sense, dear Watson! People all around the world are and have been doing this to their cats since mid-summer(2015). What is “this” exactly? Well, they are sneaking cucumbers behind their cat’s back while it is eating. What happens is once the cat is done eating, it immediately jumps in the air and runs from it upon seeing it. I’m not going to lie and say I didn’t laugh at this when I saw the video that went viral, I am only human. However, I want to get the point across of why this is not a good thing to be doing it to your own cat. Most internet “trends” are very rarely thought out to begin with and that is reason enough for this one to be deemed litterbox material. People believe it to be the cucumber itself but common sense will tell you otherwise. Imagine you are sitting at the table eating and someone or something is placed behind you while you are eating. You do not know they or it is there. Upon standing up from the table you turn to see this person or object, what do you think will happen? You are going to be startled. Cucumbers aren’t your cat’s arch-nemesis. You can do this with any object big enough to catch your cat’s attention… But I am not encouraging you to try this! Another point I want to make is that shades of green are more vivid to a cat’s sight so naturally a green cucumber will stand out a lot more. Also, let’s not leave out the fact that cats have poor far-sighted vision. This basically means anything close enough will look blurred and larger than it appears. I will not have to say much to convince you why this is a bad to do to your cat. I’ll list off a few reasons and you will get the point pretty quickly. Scaring your cat after it eats can cause your cat to swallow air which can lead to a twisted spleen. If it sounds bad to you, that is because it is! Scaring your cat after it eats can result in your cat vomiting and possibly choking/suffocating on said vomit. Older cats can actually have heart attacks from being suddenly startled, just like humans. Your cat can jump and land wrong or hurt itself on any near-by object resulting in anything from broken teeth to brain damage. Younger cats who are not completely developed (i.e. kittens) can do permanent damage to their hind-legs which can result in painful issues later in life. 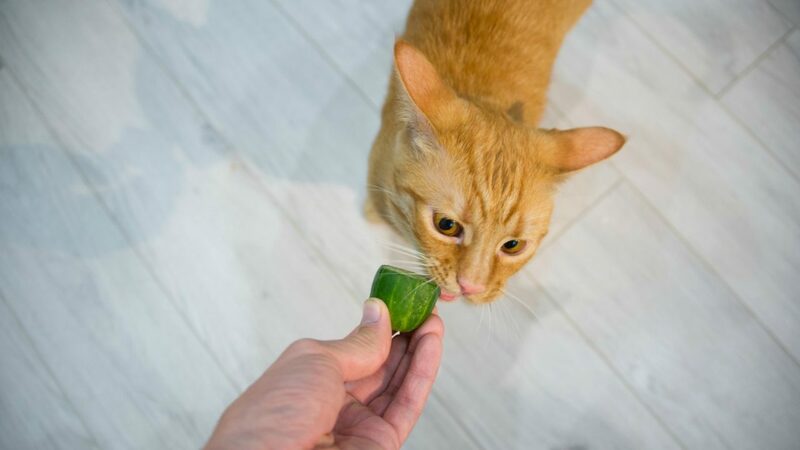 Cucumber Scares Are Bad Aside from the possible health risks and stress, scaring your cat on purpose can make your cat lose trust in you. Just don't do it. What is something your cat is actually afraid of? Share in the comments!